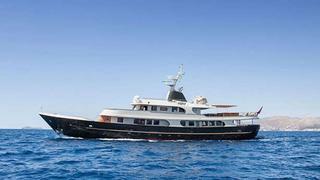 Burgess tells me that they've listed the 40m motor yacht Meserret for sale. Built by Spain's Astilleros Armon yard in 1980 and refitted in 2002, this elegant canoe stern all-steel motor yacht is a classic gentleman’s world cruiser. She is a well-maintained, truly ocean-going vessel with an impressive 7,000 nautical mile range. Fully rebuilt in 2002, the yacht presents in very good condition. The yacht enjoys fantastic guest spaces for her size: an intelligent arrangement combined with large windows throughout the main deck ensures that the interior is filled with natural light, offset by light-coloured fabrics and furnishings which contrast well with the yacht’s beautiful wood panelling. Meserret has a flexible accommodation arrangement which comfortably sleeps 12 guests in a master suite on the lower deck, a VIP on the main deck forward and four further guest cabins (one double and three twins). In the current arrangement, the formal dining room has been converted to a double cabin with en suite shower room. Meserret has a good sized upper deck lounge which opens up onto a covered external dining table and a very spacious outdoor seating area. The top sundeck has a Jacuzzi surrounded by sun pads. Meserret is asking $6.5 million.